Tune out and relax: that’s what it’s all about in our saunas. Better than anywhere else. When it comes to relaxing, you are spoiled for choice between four different saunas in the over 8600 sq. ft. spa area at Hotel Tirler. 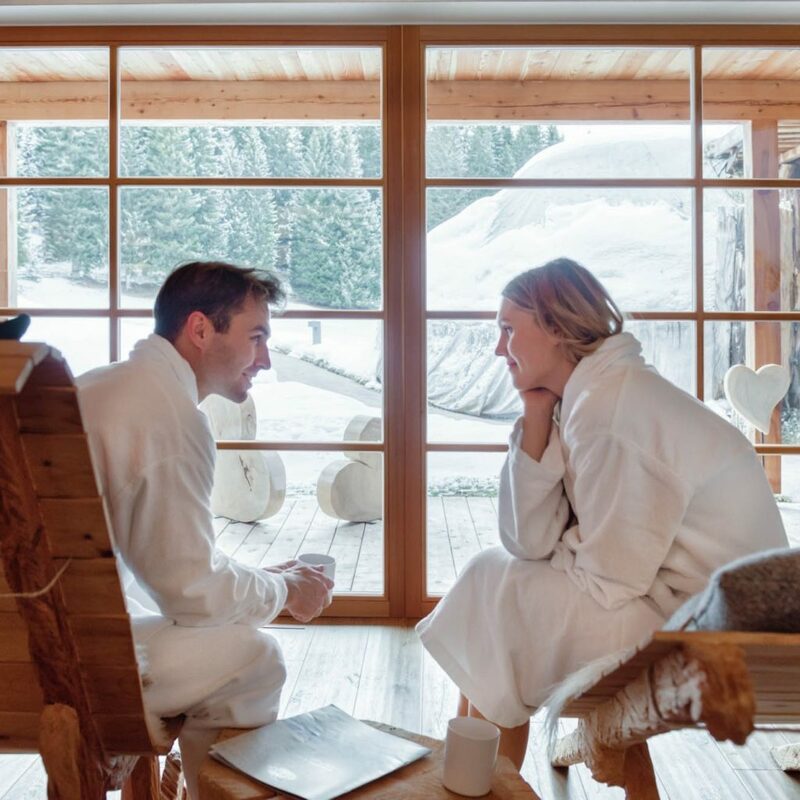 There is an organic Swiss pine sauna, a Turkish bath, a hay aroma sauna, and a panoramic sauna to choose from. In addition, there is a Kneipp course as well as a series of relaxation areas where you relax and restore yourself. If you don’t like your sauna to be too hot, you will feel particularly comfortable in our organic Swiss pine sauna. It reaches temperatures between 50-60°C (122-140°F) and the humidity ranges between 45 and 55%. 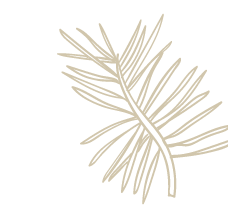 It is a pleasant heat that rests on your skin, while the aroma of essential oils, especially those of Swiss pine, rises in your nose to unleash their calming effect. After just a few minutes, your skin and hair feel silky soft, every pore is cleansed, and your nose and airways are pleasantly clear. Warm, but above all extremely humid: that’s what distinguishes a Turkish bath, to which we can add another benefit – the scent of mountain meadows. The essential oils of the medicinal herbs from the mountain meadows are spread with the steam in the bath, which not only has a purifying, relaxing effect, but also has a healing effect. Our most extraordinary, our most exclusive sauna is the igloo-shaped hay sauna, where temperatures rise to 90°C (195°F), but time the humidity is kept at a low 10-30%. 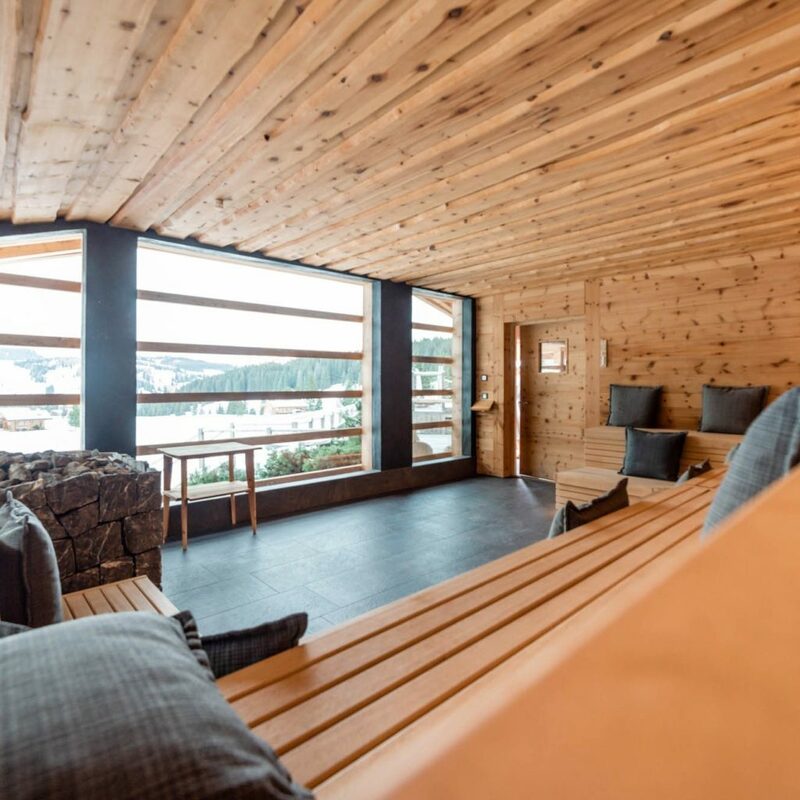 The sauna consists of Swiss pine wood, which can give off its particularly soothing aroma, as well as the hand-cut hay of the Seiser Alm. 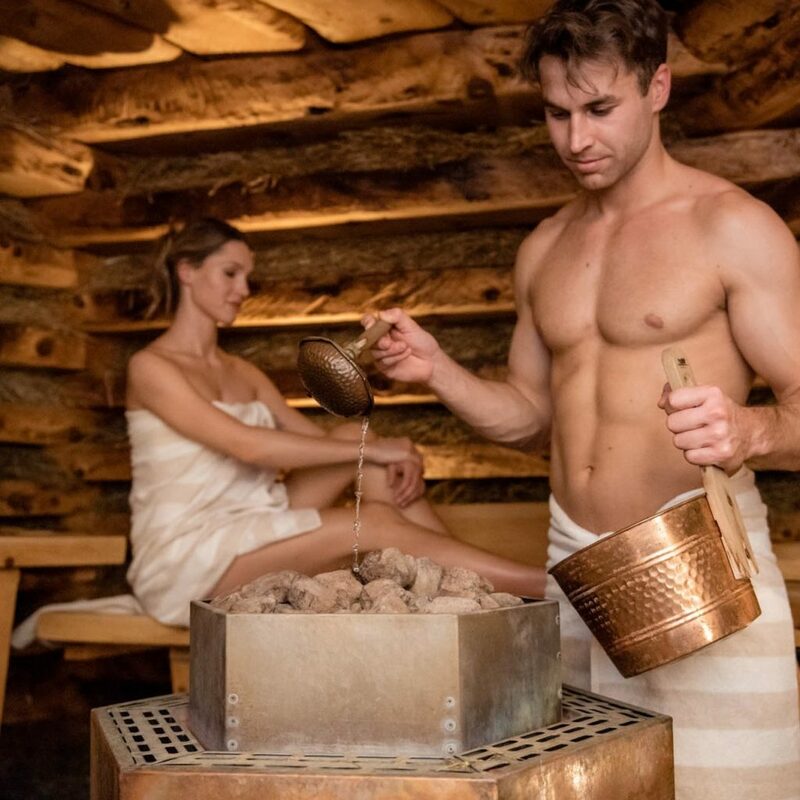 This is characterized by a high proportion of herbs, which you can smell and feel in the hay sauna: it stimulates circulation, strengthens the immune system and expunges toxins from the body. Similar to the hay sauna, the panoramic sauna also consists of Swiss pine wood, dolomite stone and also safety glass. Through this glass you can enjoy an unmatched view of the Seiser Alm, while letting the high temperatures at low humidity work on you. 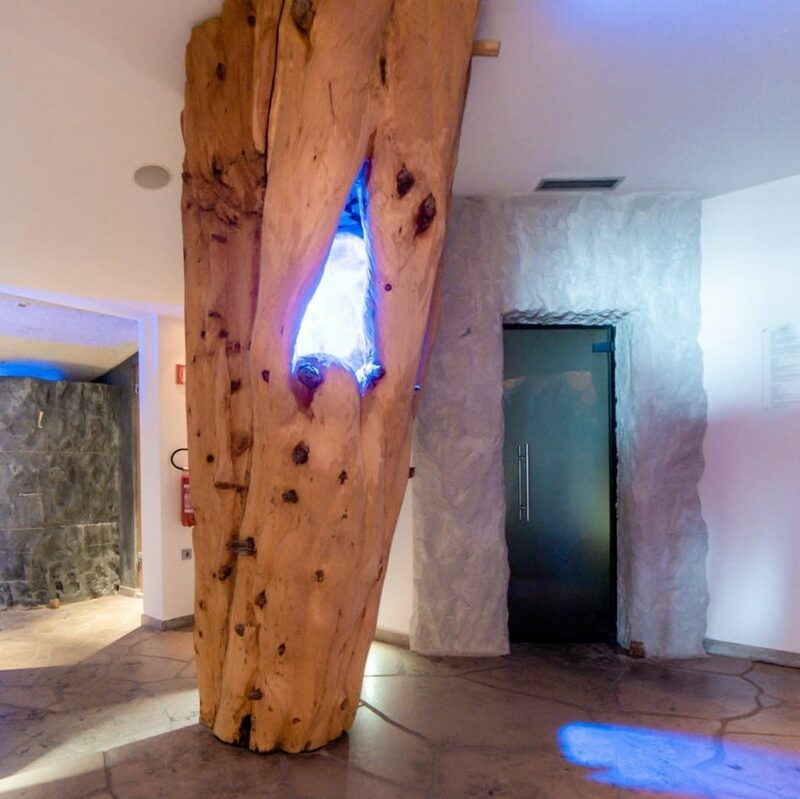 A session in this sauna is not only balm for soul and body, but also for the eyes. 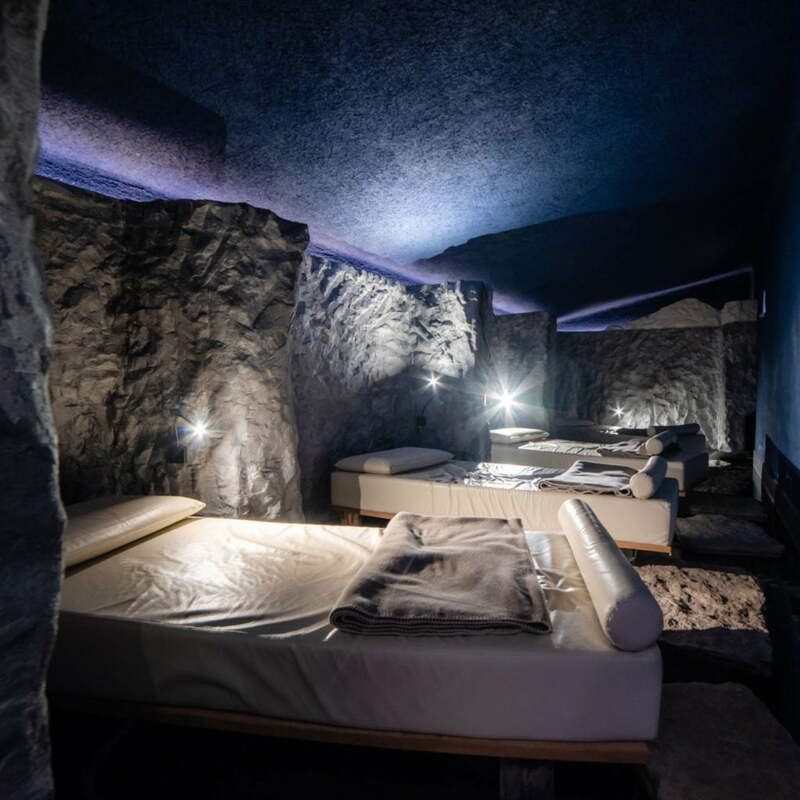 You come out of the sauna deeply relaxed and continue this deep relaxation in the energy grotto or on the loungers in the relaxation room. There is nothing to be heard here except the sounds of the nearby forest. And they let us continue to find tranquility. The spa area is open from 3:00 pm to 7:30 pm. The spa area is a place of relaxation and tranquility. Children under 14 years are not allowed in. In each room you will find a bag with everything you need in the spa area: from a towel to a bathrobe.